As you may probably have picked up from the previous posts, it’s been a bit of a tough slog getting into the whole electronics modification side of chiptune music. It reminded me a bit of learning to drive. You keep thinking – how on earth can I find this so difficult when so many other people find it so easy? 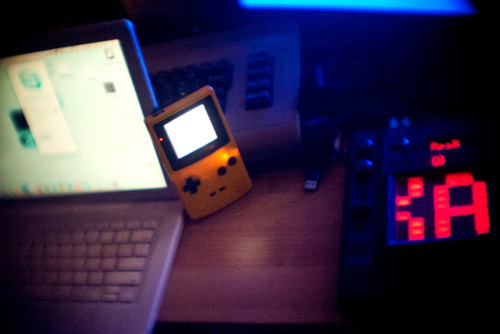 After hours and hours and hours of accumulated research though, I’ve finally taken a big jump forward and managed to front-light the Gameboy Color so I can use it to compose stuff on whenever and wherever. I did also add an extra 3.5mm line-out, but discovered that Maplin had given me the wrong jack… mono instead of stereo… which put the kaibosh on that plan. Either way, soldering mistakes and cut hands aside, things are starting to settle in. 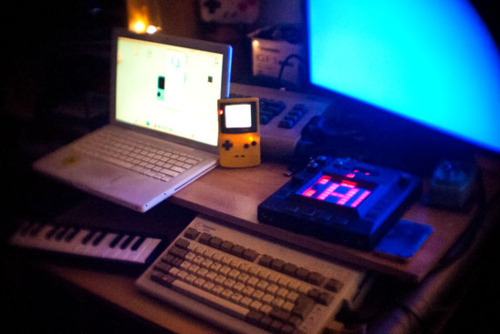 Here’s a couple of shots of the Gameboy in all its illuminated glory; nestled snugly beside the other electronic gear.